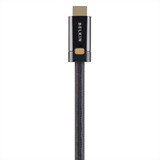 Belkin ProHD 4000 Series HDMI Cable unleashes the full HD potential for ultra-realistic picture and sound. The ProHD 4000 HDMI Cable is engineered and built to surpass the highest industry standards. Boosted by bandwidth speeds greater than 15.8Gbps, this HDMI Cable provides simply the finest-quality video performance and audio detail possible from your HD content. HDMI (High-Definition Multimedia Interface®) delivers the best possible picture and sound quality that your advanced AV equipment can deliver. Your HD experience is completely dependent on the quality of HDMI cables that you use with your AV components. Belkin HDMI Cables are constructed beyond industry standards to achieve peak performance and maximum AV viewing and hearing experience.